Volleyball Canada is pleased to announce the 2016/2017 National Championships host cities. Unlike 2015, which was a year that the Volleyball Canada Championship was held in one city with 10,000 participants, the next two years will see the youth tournaments in various locations across the country. 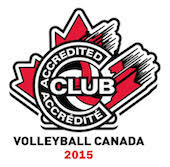 All host cities went through a bidding process and were chosen for meeting the criteria set out by Volleyball Canada. Details on registration and other information will be released in the coming months. The “Stay to Play” policy will be in effect for all events, so all hotel bookings will need to be completed through each event’s hotel provider(s). Due to the cancelation of a venue, a RFP is being released for a host partner (preferred date is May 12-15, but will not be confirmed until the fall of 2015). Due to the cancelation of a venue, a RFP is being released for a host partner (preferred date is May 11-14, but will not be confirmed until the fall of 2015).